Beautifully engraved certificate from the Euro Tunnel P.L.C. 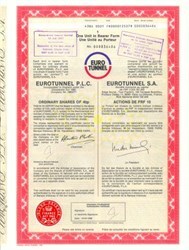 (English Company) and the Eurotunnel S.A. (French Company)issued in 1988. This historic document has an ornate border around it with a vignette of the company's logo. This item has the printed signatures of the Company’s President and Chairman and is over 13 years old. Eurotunnel is neither British nor French. It is a bi-national company which, in line with its mission statement, has a policy of integrating staff from both cultures. This policy manifests itself in the single management structure and in the creation of other structures to ensure equal benefits and opportunities for employees. For example in the UK a "Company Council" has been established, on which members of the UK staff and management are represented, to mirror the French "comité d’entreprise". Employment contracts are either French or English and governed by the legal regime of that country. The $15 billion Channel Tunnel makes the old dream of a ground link between Great Britain and continental Europe a reality for the first time since the Ice Ages. The tunnel consists of 3 interconnected tubes: 1 rail track each way plus 1 service tunnel. Its length is 31 miles, of which 23 miles are underwater. Its average depth is 150 feet under the seabed. The channel crossing time for Eurostar is only 20 minutes. 95 miles of tunnels were dug by nearly 13,000 engineers, technicians and workers. The volume of rubble removed from the tunnel is three times greater than that of the Cheops Pyramid in Egypt. And it has increased the size of Britain by 90 acres. Equivalent to 68 football fields, this area has been made into a park. The tunnels lie on average 40 m below the Channel seabed. Two of the three tunnels are for railway traffic (shuttles and trains). Each rail tunnel has a single rail track, and has been designed so that it can be operated in either direction. Rail traffic to France usually travels through the north tunnel (tunnel 2) and traffic from France usually travels through the south tunnel (tunnel 1). Every 375 m, cross-passages connect the two rail tunnels to a central service tunnel which provides access for safety and maintenance purposes. This service tunnel, the only one of its kind in the world, is for specially designed or adapted road vehicles (electric and diesel) used by Eurotunnel, the emergency services and maintenance workers. The service tunnel is maintained at a higher air pressure than the rail tunnels, thus remaining free from smoke and fumes in the event of a fire in one of the rail tunnels. The service tunnel is therefore a safe haven in the event of an evacuation. It was used by the passengers and staff safely evacuated during the fire on 18 November 1996. It is also used for the regular exercises conducted by Eurotunnel and the emergency services. Up to September 1986, the five banks and the 10 construction companies, Eurotunnel’s founder shareholders, contributed FRF 0.5 billion. In October 1986, Eurotunnel increased its equity to approximately FRF 2.5 billion by a "private placing" involving major international investors. On 4 November 1987, the Credit Agreement was signed, followed on 16 November by a public equity offer with shares listed on the stock markets. The public subscriptions and the private placing attracted more than 300,000 new investors (100,000 in the UK and 200,000 in France). There were two further equity issues prior to the start of commercial services : in November 1990 and May 1994. The shareholding has evolved over the years, the number of shareholders rising from 615.000 in 1990 to 721,000 in 1994. The number fell again to 690,000 as of 31 December 1997, at which point 683,000 individual shareholders held 69 % of the equity, 11 % being British and 58 % French. Following the Financial Restructuring and the issue of equity to the banks on 7 April 1998, in exchange for a reduction of part of the debt, the number of Eurotunnel units has increased from 919,553,419 to 1,688,784,219. The inclusion of these new shareholders and the reclassification of certain shares have modified the shareholding structure : at the end of June 1998, individual shareholders own just over 48 % of the equity. 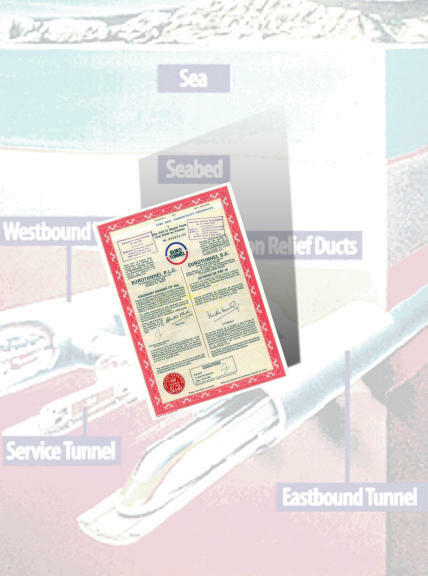 March 1985 The British and French governments issue an international invitation to promoters for the development, construction, financing and operation of a cross-Channel fixed link. 20 January 1986 The twin-rail tunnel is chosen by the British and French governments. 12 February 1986 The Franco-British Channel Fixed Link Treaty is signed in Canterbury. 14 March 1986 Signing of the Concession Agreement between the British and French governments, on the one hand, and the Channel Tunnel Group Ltd and France Manche SA, on the other. 13 August 1986 Formation of the Eurotunnel Group. 29 July 1987 Ratification of the Treaty. 4 November 1987 Signature of the Bank Credit Agreement. 16 November 1987 Equity III - First offer of shares to the public Stock Exchange listing. November 1990 and May 1994 Further issues of share capital. 1 December 1987 Tunnelling starts on the UK side. 1 December 1990 British and French tunnelling teams achieve the first historic breakthrough under the Channel, in the service tunnel, 22.3 km from the UK and 15.6 km from France. 28 June 1991 Final breakthrough, in the north rail tunnel. 10 December 1993 Handover from Transmanche Link (TML), the construction company to Eurotunnel, the operators. 1993-1994 Completion of fitting out and testing. 6 May 1994 Official opening by Queen Elizabeth II and the French President, François Mitterrand. 1 June 1994 The first freight train passes through the Channel Tunnel. 25 July 1994 Start of Eurotunnel freight shuttle services. 14 November 1994 Eurostar services start. 22 December 1994 Start of Eurotunnel passenger shuttle services. 26 June 1995 First shuttle services for coaches. 18 November 1996 Fire in the south tunnel, caused by a lorry on a freight shuttle. 14 September 1995 Eurotunnel suspends payment of interest on the junior debt ("standstill"). 2 October 1996 Agreement in principle between Eurotunnel and the banks for the restructuring of the debt. 10 July 1997 Shareholders adopt the Financial Restructuring plan at an extraordinary general meeting. 26 November 1997 Financial Restructuring unanimously approved by the banking syndicate. 19 December 1997 Agreement to extend the Concession until 2086. 30 January 1998 Official signing of the Financial Restructuring agreement. 30 March 1998 Issue of equity reserved for banks. 7 April 1998 Definitive implementation of the Financial Restructuring.